Instead we were grounded. Both of the littles fell victim to some kind of vicious bug that had Cooter not able to eat anything and our Princess the same, only with a big ol’ fever to go along with it. No one needed to come in here and be exposed to that, even if I had been able to muster the wherewithal to leave my sick babies. Which I couldn’t. So we were home. A day that we had prepped for by tidying up a bit and trying to get organized somewhat (y’all who know me well can stop laughing now, I said tried). Our Princess stayed in her bed and slept most of the day, while Cooter slowly came back from an exhausting night of not being able to stomach anything. He watched movies and played games and rested. While I alternated between caring for the two, I also took a breather and had some quiet time during the day. My oldest though? She sat in her sister’s room at our Princess’ request, so she’d have company and wouldn’t feel quite so lonely. She sat and watched videos with her brother. She made a Ginger Ale/Sprite/Noodles/Frozen Waffle run (like you do) as we were out of all of those healing things. She picked up magical healing serum in the form of Chick-Fil-A Sprites-to-go for her siblings, and she listened to my worrying over what was best to do for our Princess. She reminds me of my Mama the way she can ease my concerns with compassion and commonsense. And so her words broke my heart. Yes, she relaxed and watched a couple of her favorite shows. She took a nap. She didn’t work on her paper or clean her room. But that she didn’t see the value of what she did, the love she shared, the help she was in all the little moments all day long? I need to take her to the eye doctor. Or soul doctor or something. I think she needs a new pair of lenses. A kinder, gentler pair. Ones filled with grace, which can see the little details for what they are. The million ways she blessed all of us all day long. She might not have changed the world yesterday, but she changed our world. She made things better just by showing up. By her willingness to sit and be. By her willingness to go and do. By being her. The one we love. And sharing that special person with us for the day. Baby girl, if ever you doubt the value of what you do, I want you to remember your brother’s face as he grabbed you this morning and exclaimed, “You’re the second person I hugged today!” Or the way each of your siblings told you with their weak little voices very early yesterday morning, “Go. I’ll be okay. I don’t want to ruin your day.” Or me. As you changed out the lightbulbs in my closet today. You couldn’t see my face while you were up on the ladder, and that’s probably a good thing. As I was teasing you and trying to take your picture, I was teary-eyed. This little one whom I fell in love with from the first moment I saw her twenty years ago, is making a difference in our world. One hug, one smile, one teasing gesture, one CFA drive thru trip, and one moment at a time. Never doubt that. Thanks for lighting up our world, literally and figuratively. 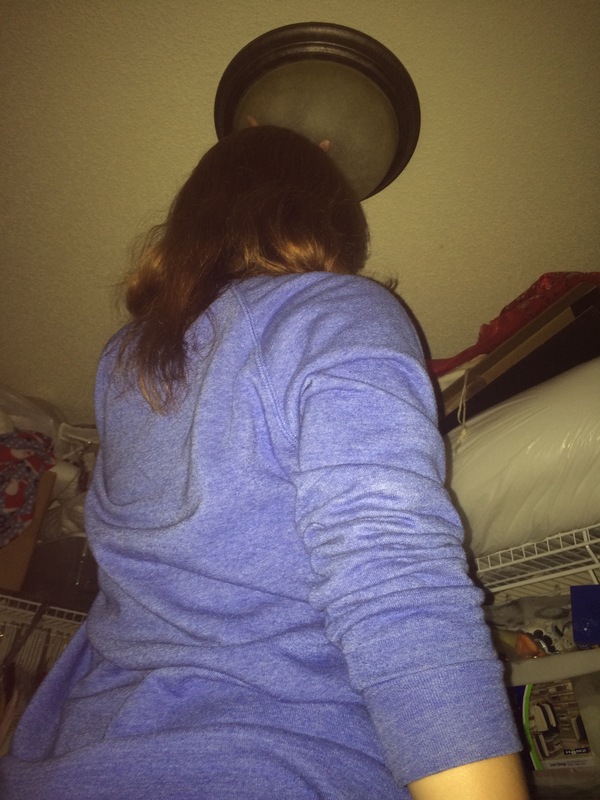 My girl helping shine light in our world…..and my closet.